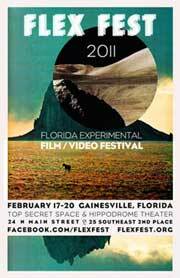 This news is being posted a bit late as the 7th annual Florida Experimental Film/Video Festival was held a month back on Feb. 17-20. But, below you’ll find the full list of films that won prizes. There were four different categories: Two for films and videos over ten minutes long, plus two for films and videos under ten minutes. Then, there was also a special Film Stock Prize sponsored by Kodak. The jurors who picked the winning films were film preservationist Mark Toscano and Portland-based filmmaker Vanessa Renwick. Out of all the winners, I’ve only personally seen one film in full: Penny Lane‘s The Voyagers, a lovely documentary about the love affair between astronomer Carl Sagan and his third wife Ann Druyan while they worked on the Voyager space probe mission in the ’70s. However, a few other Underground Film Journal favorites either received an award or a mention, including Georg Koszulinski for his White House and Martha Colburn for her Triumph of the Wild. Plus, one of the winners for Kodak’s Film Stock Prize was Steve Cossman for TUSSLEMUSCLE, of which I’ve seen a wonderful clip. The film is a beautiful, rapid fire montage of images cut out of old ViewMaster slides. The FLEX Fest is held every year in Gainesville, FL. However, it alternates each year with a juried festival, such as this edition, and a curated festival, which will be next year.